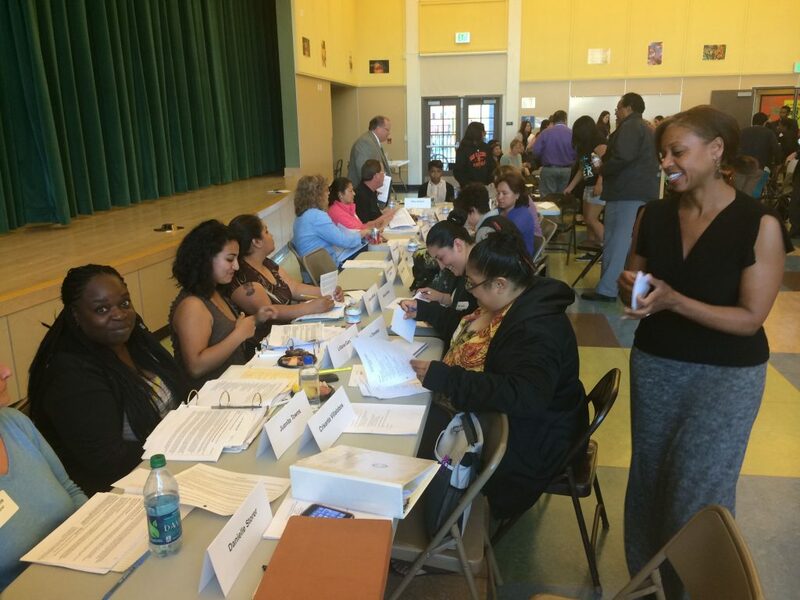 Parents and school officials review a draft of the West Contra Costa Unified LCAP. In response to critiques from a range of sources, the state is moving toward making the Local Control and Accountability Plans that districts are required to draw up more understandable and user-friendly. The State Board of Education is expected to vote next week in Sacramento on recommendations from the California Department of Education to authorize the department to overhaul the template that districts have been required to use for their plans, known widely in education circles as the LCAP (pronounced el-cap). Among the changes being considered, according to a department memo to the board, is a simplification of “the structure and language” of the 16-page template itself, as well as better instructions and more support for the school officials who have to draw up the plan. Districts may also be required to include an executive summary to make the plans more useful to those without the time, patience or knowledge to wade through a document that in some districts runs to hundreds of pages. The recommendation comes on the heels of a survey conducted by the California Department of Education in March to get direct feedback from school administrators about their views on the template. Nearly 400 school administrators responded to the non-representative survey, along with nearly 200 school board members, parents, principals, teachers and representatives of nonprofit organizations. A report last fall by EdSource found that the accountability plans had mushroomed in size. The average length of the LCAP in the state’s 30 largest districts had grown to 145 pages this year from 45 pages last year. 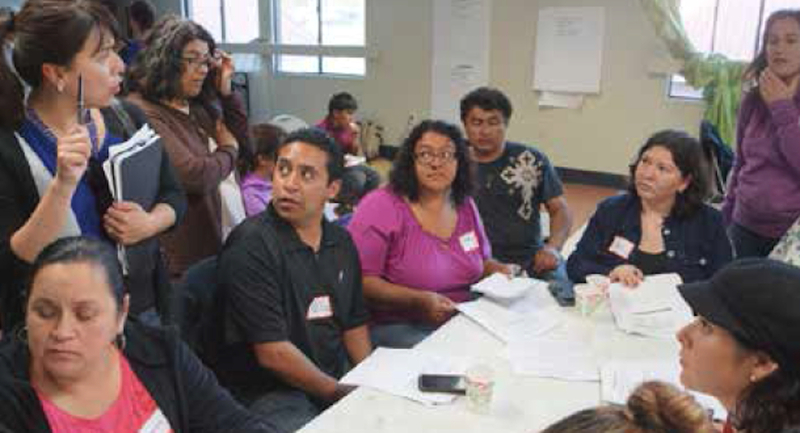 Several other advocacy groups have also documented a range of problems with the LCAP. “These documents are getting longer, but not any clearer,” said Samantha Tran, senior managing director of Children Now, an Oakland-based advocacy group. She welcomed the proposed changes, although she said that it was not yet clear what revisions the state will eventually make. If the state board gives the green light to the proposal, further input will be sought on the redesigned template from key constituencies before presenting it to the board at its July meeting for approval. The changes would go into effect for the accountability plans covering the 2017-18 school year. Respondents also expressed unhappiness with the annual updates required by the state to what are supposed to be three year plans. According to the survey, these updates “may be accessible to educational professionals but not to other stakeholder groups.” One of the recommendations to the board is to ensure that the annual updates are in fact updates, and don’t involve what amounts to a rewrite of the plan each year. Children Now’s Tran said her organization would have preferred to see a greater emphasis on requiring districts to provide more specifics on how state funds will be spent, especially the additional funds they receive to improve how they educate low-income students, English learners, and foster and homeless children. Jongco of Public Advocates said her organization also wanted to make sure “that the improvements to make the document more accessible do not sacrifice the fiscal transparency and equity principles at the heart of the Local Control Funding Formula,” the law that created the accountability plans. State officials have a compelling reason to make changes to the LCAP, which the state board already did 18 months ago. Districts spend large amounts of time drawing up these plans, and they are at the heart of major reforms of the school financing system championed by Gov. Jerry Brown as part of his effort to promote a new, decentralized approach to holding districts accountable for how well, or badly, their students do. A particular concern is that the LCAP not become simply a document that complies with the requirements of the law. That has been the fate of the School Accountability Report Card, an annual report known as the “SARC” that every school in the state is still required to draw up. It was mandated by Proposition 98, approved by voters in 1988. Over the years, the SARC has also grown to an unwieldy length and, in many instances, is read by few. Like the current LCAPs, the SARCs were supposed to provide information to ordinary Californians to “ensure our schools are spending money where it is needed most,” according to the language of the Prop. 98 initiative. Interesting that there was “considerable” feedback in this survey – which, if you read the actual document, means they got 571 responses. And, of those 571, only 26 were parents – the people the template redesign is supposed to be benefiting. Now, as the parent representative on my school district’s LCAP committee, one would think I would have somehow found out about this and participated. I mean, after all, if someone who sits in a room with members of the district administration every month discussing the LCAP doesn’t know the survey exists, who does? Now, there are 6.2 million kids enrolled in K-12 in California. Assuming each has two parents, that means a total of 12.4 million parents. Having a survey that gets a response rate of 0.00021% – in any normal world – is called “useless data”, or perhaps “invalid”, or a “failure”…. But in School World, it’s actionable data? I am confused by this whole process. The first template was criticized for all the same reasons, yet the changes made to it actually made it worse in most ways. Both template’s structures were unwieldy and made actual information opaque. The lack of any overview has always been mind-boggling. This makes me think the obfuscation is intentional. Finally, the SARC is actually not a bad document, if you can find it. The biggest reason it’s read by few is it is generally not made available. However, it also has its problems, including that data can be literally years behind. If the SBE actually cared about data and action transparency, they could do a few things to immediately create it. So I doubt much will change this time either. I remembered there was a way to find SARCs for any district on the CDE website. Thanks. I didn’t mean I didn’t know how to find it, just that many district or school websites either hide it or don’t publish it at all. Most parents don’t even know it exists so unless it’s presented to them somehow they won’t know to go looking. Our school used to have a prominent link on their web page, and even passed out a hardcopy once a year.